UDM Downloads > A-PDF Office to PDF! 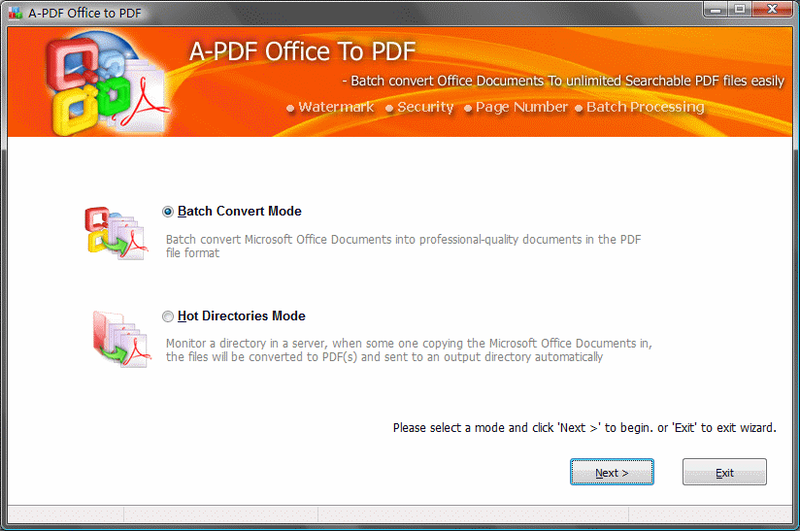 A-PDF Office to PDF is a fast, affordable way to batch convert Microsoft Office documents(Word, Excel and Powerpoint, Infopath, Publisher, Visio) into professional-quality documents in the popular PDF file format. Its easy-to-use interface allows you to batch create PDF files even support monitor hot directory. A-PDF Office to PDF supports watermark, security, page number, properties and viewer setting also. A-PDF Office to PDF does not need adobe acrobat. Easy to Use Converting Microsoft Office documents into PDF files couldn't be more easy. Simply Drag the DOC files to the file list which you want to convert into PDF file and click the "Convert to PDF And Save as" button, A-PDF Office to PDF quickly re-creates your DOC file as a fully formatted PDF files. Fast Get the job done in seconds or minutes, not hours or days. A-PDF Office to PDF eliminates the need to re-key and re-format PDF documents, saving you both time and money. Accurate You will be amazed at the results you get from Office to PDF Converter. It accurately retains the layout of the original Doc file. Converts text in over 100 languages and separates graphics from tables and text. Powerful. Now you can do more than view PDF files. Document Format (PDF) is the fact standard for the secure and reliable distribution and exchange of electronic documents and forms around the world, and now you can convert any MS office documents into professional-quality PDF file format only by one click.